When Bitcoin was created in 2008, the aim was to create a global, electronic cash system free from the intervention of governments and central banks. The only problem was no one used it. Fast forward to today and you can exchange bitcoin for local fiat in almost every country in the world—and nobody can stop you. Bitcoin and competing coins have come a long way, but they're imperfect for international money transfers. Not only is typing in a 34-character address each time you send money annoying, but if you make a mistake, you can't reverse the transaction and get your money back. Limited on and off ramps into crypto also can make it hard to exchange for local fiat currency. For most people, most of the time, using a service like TransferWise or PayPal to send money is the best option. In exchange for a small transfer fee, these services abstract away the complexity of ACH deposits and exchange rates. All you have to do is click a button to send money thousands of miles away. Send money to a country that is facing sanctions and cut off from the international banking system. For example, U.S. sanctions against Iran mean that it's impossible to send money to the country through the traditional financial system. Send transactions at risk of being frozen or stopped by services like TransferWise and PayPal. For example, you have a low credit score and your transactions get flagged by the service. Send money quickly with very low fees. For example, you're an immigrant to the U.S. from the Philippines, and need to send your family $50 a week. When you send money internationally through TransferWise or PayPal, and you're subject to their rules and regulations. Bitcoin and other cryptocurrencies sidestep this centralized control. With Bitcoin, you can send a transaction to anywhere in the world for as little as 30 cents, twenty-four hours a day, seven days a week. Since Bitcoin was created, dozens of alternatives have cropped up, many promising to facilitate international payments more quickly and cheaply. In this guide, we'll help you pick the right coin to send money internationally, focusing on adoption, fees, speed, and ease of use. To send money to China, Iran, or Venezuela, you should use bitcoin. Out of all the coins on our list, bitcoin has the best mix of reliability and widespread adoption—making it easy to both buy and cash out from. The table above shows a sample of countries that aren't supported by either Paypal or TransferWise. 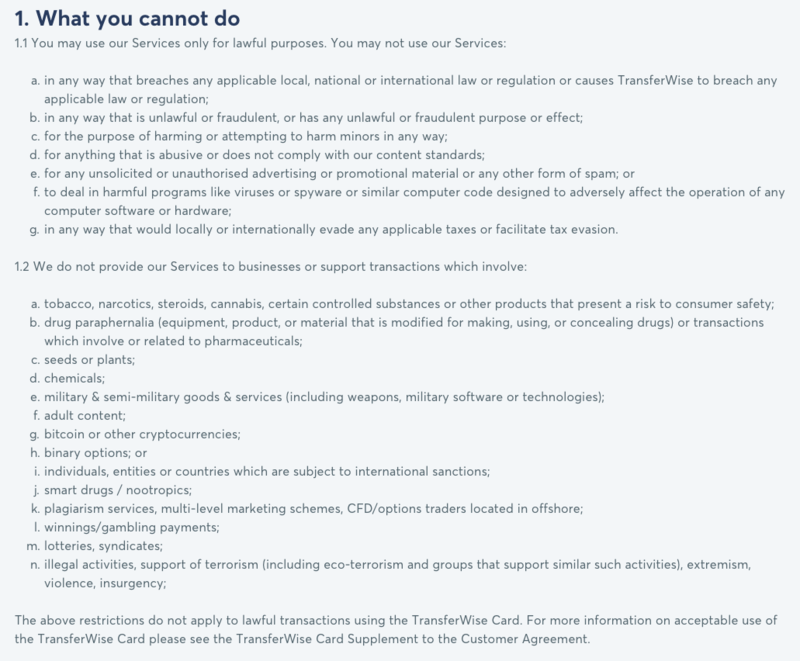 Today, it's impossible to send money to Iran from the US or Europe via PayPal, TransferWise, or even a bank transfer. Economic sanctions leveled against Iran have completely cut the country off from the global financial system—including SWIFT. But if you're using Bitcoin, you don't need a bank. All you need is funds in your wallet and a 34-character address to send money to. To cash out, the recipient can use an over-the-counter service like LocalBitcoins or BitBarg to exchange bitcoin for a local bank transfer. Or they can deposit the bitcoin in an exchange like Exir.io and convert it into the Iranian rial. 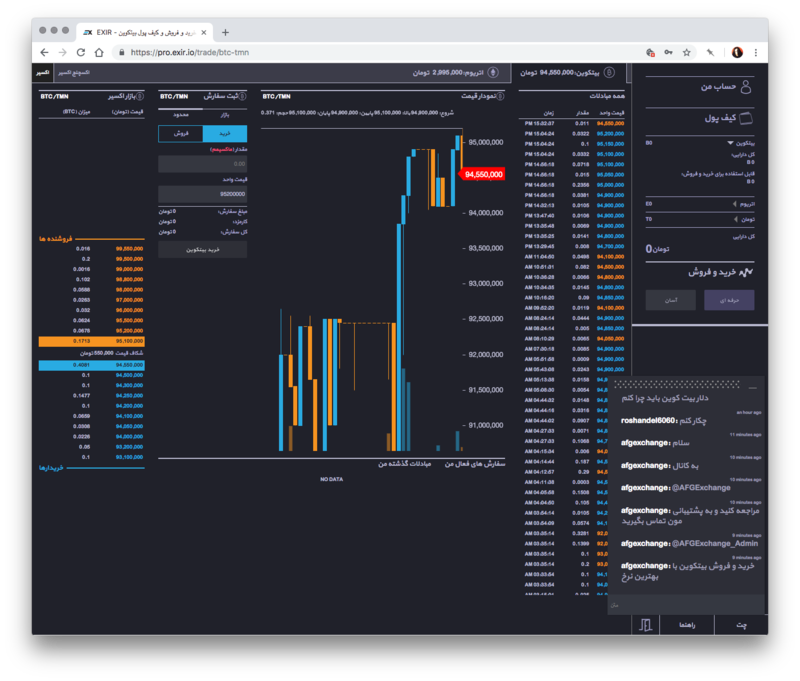 The orderbook for Bitcoin on Exir, an Iranian cryptocurrency exchange. One bitcoin trades for 94,550,000 toman. That's the equivalent of around $22,512 according to the official Iranian exchange rate, or $6,200 according to black market rates. Bitcoin is censorship-resistant by design. What that means is that as long as you can send a transaction to a node via a working internet connection—or even satellite— no one can prevent you from sending it. That's part of what makes it so different from using something like PayPal or TransferWise, where your money is subject to confiscation. The table above lists available fiat pairs for Bitcoin across exchanges, along with supported countries for withdrawals. Just because an exchange supports a fiat pair, however, doesn't mean you can withdraw that fiat currency to your country. While you can't find an exchange that supports trading in every currency, you can always buy and sell bitcoin over-the-counter. LocalBitcoins alone has listings for over 248 different countries and territories. Description OTC service matching buyers with sellers. OTC service matching buyers with sellers. OTC service focused on China. Allows you to buy Bitcoin with a credit card or debit card. Bisq is a fully decentralized P2P service, but has a low volume of listings. Fees 1% for seller 1% for seller .7% for seller 6% for buyer. The table above shows various services you can use to acquire Bitcoin around the world. Buyers should be aware that exchanges that allow you to buy bitcoin with a credit card or bank transfer typically require identification to comply with the law. If you're buying bitcoin through an exchange with your bank account, it can take several days to verify your ID and fund the account. Over-the-counter services like LocalBitcoins typically don't require identification except for large transactions. A Bitcoin transaction that incurred $19.88 in network fees last November. A Bitcoin transaction today on Coinbase costs ¢.37 in fees. There are two additional things to pay attention to when using Bitcoin to send money internationally. The first is transaction fees. While the average transaction fee for bitcoin is currently 36 cents, that fee can be substantially higher during times of high network usage. Last December, for example, transaction fees spiked to an average of $62—making Bitcoin unusable for sending money. The second is fluctuations in the exchange rate. If you're holding onto Bitcoin to send money periodically each month, the last thing that you want is for the exchange rate to sporadically decline. Bitcoin's performed better than other coins on this front. Since May, the price of bitcoin has stabilized to between $6,000-$7,000. Paying up to $30 in transaction fees is really painful, especially when you're sending small amounts of money frequently—and so are getting your funds frozen by PayPal. If you're sensitive to transaction fees, use Litecoin, which is both cheaper than faster than Bitcoin. While Litecoin has a smaller ecosystem of tools, it's highly adopted across exchanges, making it easy to exchange. Using Loafwallet for IOS, the above Litecoin transaction cost two cents and settled in three minutes. Transaction fees on Litecoin fall between two to three cents, and they settle quickly. With Litecoin, you can send $10,000 from the U.S. to a family member in Russia and it'll arrive within three minutes. For most people, the convenience of a service like TransferWise or PayPal will still beat out Litecoin. But for those who send money frequently in large amounts, for legally gray purposes—or simply travel a lot—these services can flag your transactions and put freezes on them. 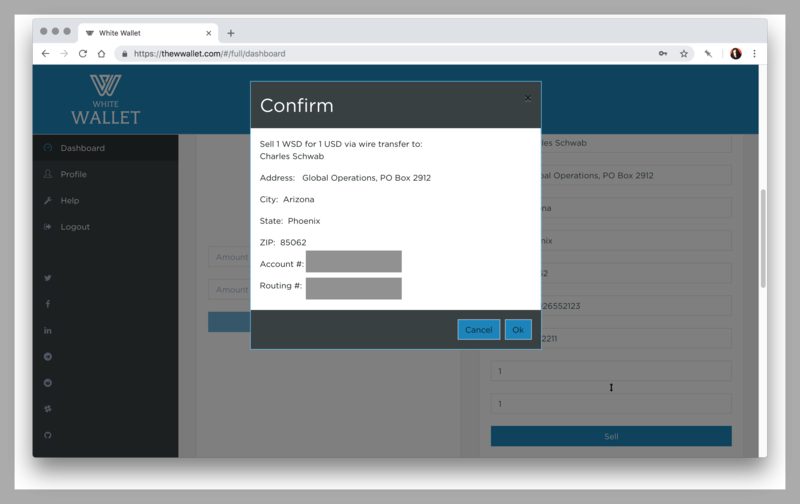 Services like TransferWise and PayPal are highly regulated, which means that they're trigger-happy when it comes to freezing suspicious transactions—which might be anything from receiving a transaction over $10,000 to sending money from an unusual IP address. These services work as a bridge between a complex web of banks and financial institutions. The internet is littered with hundreds of complaints around frozen transactions for TransferWise and PayPal alike. As with Bitcoin, nobody can stop you from sending Litecoin. Litecoin is also surprisingly well- adopted across exchanges. According to data from CoinMarketCap, you can exchange Litecoin for 21 different fiat currency pairs. The table above lists available fiat pairs for Litecoin across exchanges, along with supported countries for withdrawals. The downside to using Litecoin is that the ecosystem of services around it is much smaller. There aren't any remittance services that use Litecoin. Litecoin's over-the-counter market is also smaller than Bitcoin, which makes it less liquid in countries like Iran and China. That also means that you'll most often have to buy your Litecoin through a KYC-compliant exchange. While you can buy Litecoin over-the-counter using a service like Litecoinlocal, the vast majority of listings are in North America or Europe. Litecoin is great for fast and cheap transactions, but if you're planning on holding a digital currency in your wallet to send money, we recommend that you still go with Bitcoin. While cryptocurrencies have seen a free-fall in value over the past year, the price of Bitcoin has proved more stable than Litecoin—or any other coin on our list. We don't recommend Stellar for international payments. Stellar settles transactions in three seconds—making it faster than Litecoin—but it's less widely accepted, making it harder to exchange for local fiat. For the majority of people the trade-off isn't worth it. Despite this, Stellar has a number of useful features designed around sending money internationally that show promise. The main thing that's lacking is the ecosystem supporting it. Credits: On Stellar, anyone can issue an asset—digital or real-world—and send it over the network. Assets take the form of credits, meaning that they work as a virtual IOU that can be redeemed in real-life. An anchor is a trusted party on Stellar that issues credits. You have to trust that the anchor will redeem the credit for the asset in the real-world—just like you trust PayPal to send a transaction. Decentralized exchange: Stellar has an orderbook and a decentralized exchange built into the protocol. That means that you can create an order to buy 53 Philippine pesos for $1 USD that lives on the Stellar network—not a third-party exchange. Fiat assets trading on Stellar, accessed via StellarX marketplace. 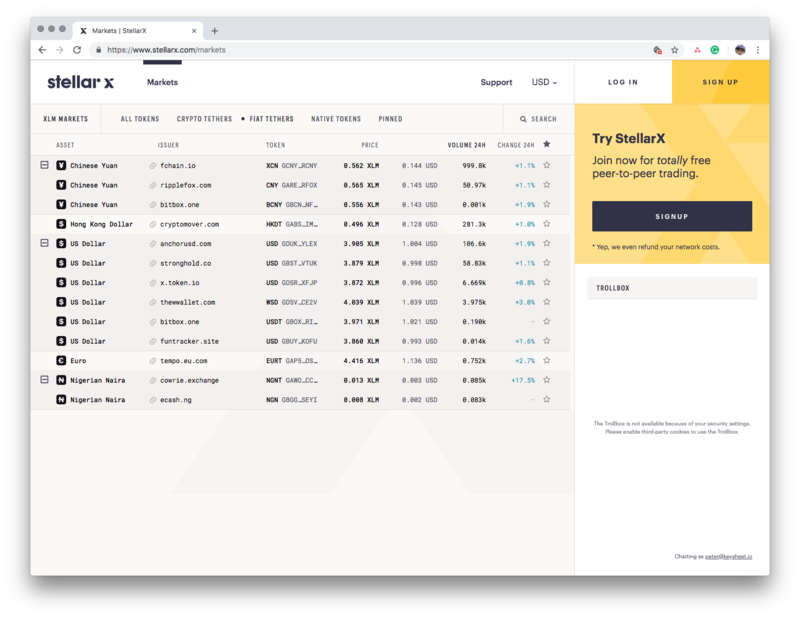 StellarX is a GUI for visualizing and interacting with the native Stellar orderbook. With enough anchors, Stellar has the potential to become the simplest way to transfer money internationally. The biggest problem is that there aren't that many anchors. Currently, there are only fifteen different anchors representing seven different fiat currencies on the StellarX marketplace. Of the ones listed, we only found four that provided an easy way (bank/wire transfer) of redeeming credits for real-world assets. The other downside to Stellar is that the network is relatively centralized. While anyone can run a node on Stellar, there is no incentive for them to do so, and there are currently only 111 public nodes on the network. That makes it vulnerable to government intervention. Compared to Bitcoin and Litecoin, Stellar also has a lower adoption rate across exchanges. According to our research, there are currently 17 fiat trading pairs available with Stellar. The table above lists available fiat pairs for Stellar across exchanges, along with supported countries for withdrawals. For now, most people are better off using Bitcoin or Litecoin to send money internationally. We don't recommend XRP for international money transfer. XRP transactions settle in three seconds or less, but for most people Litecoin's three-minute settlement time is plenty fast enough. When you use XRP to send money internationally, you're trading a negligible difference in speed for third-party control of your funds. XRP is highly centralized around Ripple the company, which controls a vast quantity of XRP. Using XRP isn't that far removed from trusting a Paypal or TransferWise with your money. While Ripple has never reversed an XRP transaction—which would destroy all trust in the currency—it's technically feasible for them to do so. The upside is that XRP is really fast. Transactions settle in three-seconds—leaps and bounds faster than Bitcoin's ten-to-thirty minute settlement times. This speed comes at the cost of centralized control. While nobody can stop you from sending a Bitcoin transaction, the same isn't true of XRP. XRP uses a special set of nodes, to validate transactions called the unique node list (UNL). While anyone can run a node, there's not much incentive to do so—XRP doesn't offer an equivalent of Bitcoin's mining rewards. Meanwhile, the default nodes on the UNL are all run by Ripple. UNL[s] [control] who has a say in changes to network rules, so theoretically, some network rule changes could make the system fully “permissioned” overnight. While Stellar is similarly centralized, Stellar doesn't implement XRP's UNL system. Meanwhile, anchors on Stellar allow anyone to exchange currencies, while XRP is being developed around banks and financial institutions. Ripple is far from trust-minimized. As a result it has high governance costs, including the disputes described here, and poor social scalability. On the flip side, if all you want to do is send money really quickly using XRP as a bridge between different currencies, these centralization risks are minimized because you're not holding onto any XRP. XRP also has a high-level adoption, with 24 different fiat pairs trading —making it liquid and easy to exchange. The table above lists available fiat pairs for XRP across exchanges, along with supported countries for withdrawals. Most people, however, won't want to exchange a local currency to or from XRP each time they want to send a transaction, which is why we recommend both Bitcoin and Litecoin over it. With so many different coins and services available for international payments, it's really tough to figure out what the right option is. Around much of the world, there are also limited on and off ramps into crypto. Sending a coin to a wallet is fast and easy; exchanging a coin for local fiat can introduce roadblocks and delays to a transaction. If you're buying or selling a coin through an exchange for the first time, you'll have to verify your identity and fund the account through a bank transfer—which might take a week or more. Using a cryptocurrency like Bitcoin for international money transfer is a multiple-step process. First, you have to exchange your local currency for digital currency. Then you send it to the recipient of the transaction, who exchanges it again into their local currency. Each step of the process can invoke fees or add delays. We'll walk you through how to send money via cryptocurrency in each situation. Bitcoin is the best option for sending money to a country like Iran, Venezuela, or China for one simple reason: it's adopted nearly everywhere, which means that the recipient of the transaction can exchange it for their local currency. Sending money to a Bitcoin address via Coinbase Pro. Coinbase Pro doesn't charge network transaction fees to send money. You can buy Bitcoin through an exchange that supports your local currency. Exchanges are generally the most cost-effective option, but will typically require that you submit some form of identification to sign up. It can also take a couple of days to a week to fund your account from your bank. You can buy Bitcoin instantly through a service like Coinmama or Changelly with a credit or debit card. These services also require identification, and they charge higher fees than exchanges—typically 5% of the transaction or more. You can buy Bitcoin over-the-counter with a service like LocalBitcoins or Paxful. Over-the-counter services are more expensive than exchanges, but you typically don't have to provide identification. Depending on the listing, you can make the purchase with cash, gift cards, Google Pay, and more. Send the Bitcoin to a destination wallet. 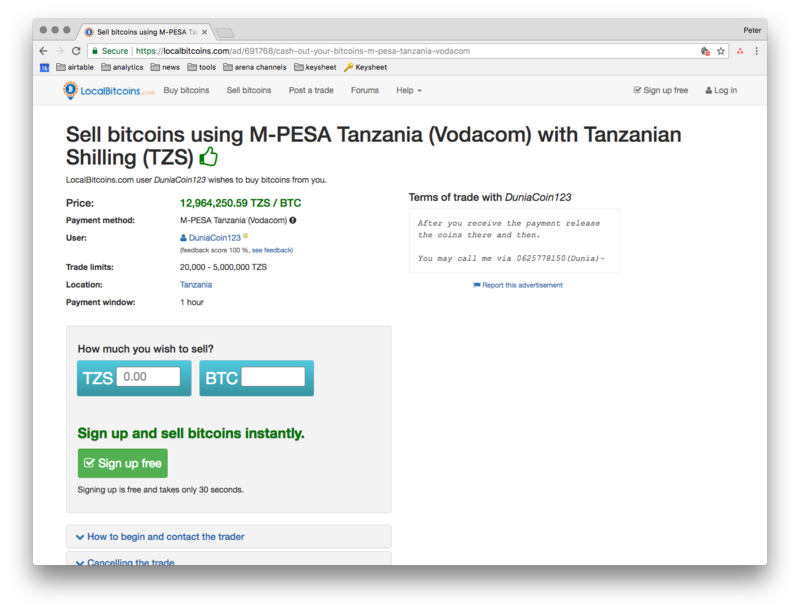 If sending money to the destination is illegal, we strongly recommend mixing your Bitcoin using a privacy coin like Monero. The recipient of the transaction can cash the Bitcoin out either through a local exchange or using an over-the-counter service. The amount of time it takes to convert it to local fiat depends on the service and country. Using a Chinese over-the-counter desk, like CoinCola, for example, you could cash out Bitcoin via WeChat same-day. Meanwhile, over-the-counter listings for Iran on LocalBitcoins only support bank transfers, which means that they take several days to process. Sending $1000 to Nigeria via BitPesa gets you $963.35 in naira, compared to $962.33 through TransferWise—a marginal difference. Most people sending money to a country like Africa or Southeast Asia, should use a centralized provider like TransferWise or Western Union. There are also several Bitcoin-based services, like BitPay, BitPesa, Rebit.ph, and Sentbe—which can be cheaper than traditional services. While you can send Bitcoin to a wallet anywhere in the world, it's not always easy to exchange it for cash. If you're sending money to an“unbanked” part of the world, the biggest hurdle of sending money isn't actually transferring the funds. It's getting cash in the hands of the recipient. Western Union can charge high fees because it offers cash pickup at 500,000 agent locations around the world. If you want to avoid centralized services entirely, your only option is to send Bitcoin and have the recipient exchange it over-the-counter. Over-the-counter services typically offer a variety of convenient options to cash out, from Alipay and WeChat in China to M-Pesa—a mobile money transfer service—in Africa. Check over-the-counter services like LocalBitcoins, Paxful, and Bisq for listings in your country. Select a service based on available cash-out options and exchange rates in your country. A good rule-of-thumb is to pick the service with the highest number of listings. That's a good sign that the market is liquid and you'll be able to find a competitive rate. Find a listing where the buyer has a high reputation score and transaction count. This reduces the risk that you lose your Bitcoin. Deposit Bitcoin into a wallet provided by the over-the-counter service. When you sell your Bitcoin, your funds will be held in escrow. Wait for your funds to arrive. Once you get it, release your Bitcoin from escrow. If you want to learn more about selling Bitcoin over-the-counter, check out a detailed guide from LocalBitcoins here. If the destination country of your payment is highly-banked and connected to the global financial system, you should send money using Litecoin. 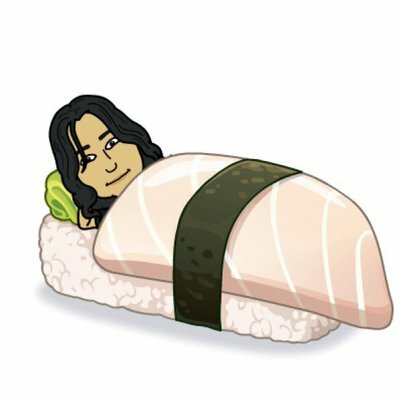 Buy Litecoin on an exchange or over-the-counter. Withdraw the Litecoin into a wallet you control, like Electrum-LTC or LoafWallet. The transaction will settle in three minutes. The recipient can then cash it out at an exchange. 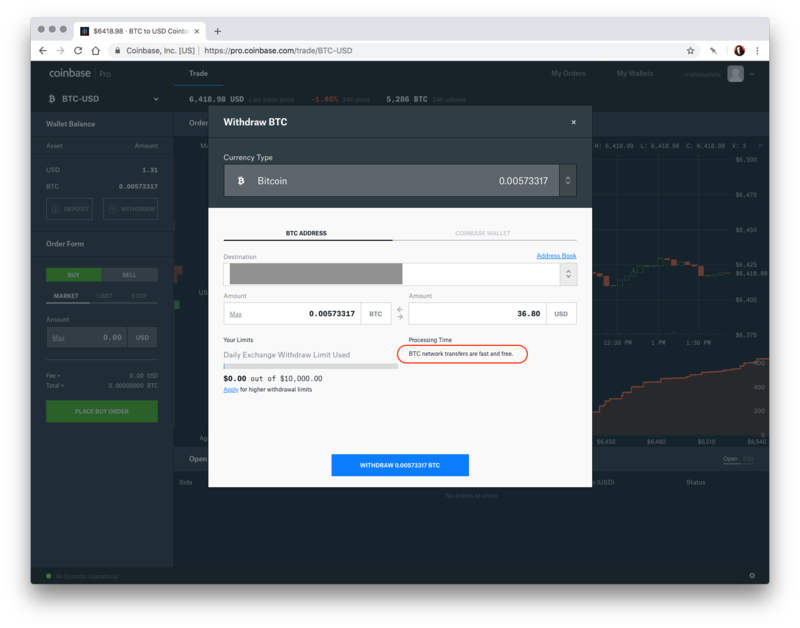 They also have the option to sell Litecoin over-the-counter with a service like LitecoinLocal, but listings are concentrated in North America and Europe, which means this isn't a viable option for everyone. If you're sending a large amount of money, using Stellar is the cheapest and fastest option—provided that there is a Stellar anchor issuing the currency you want to exchange. 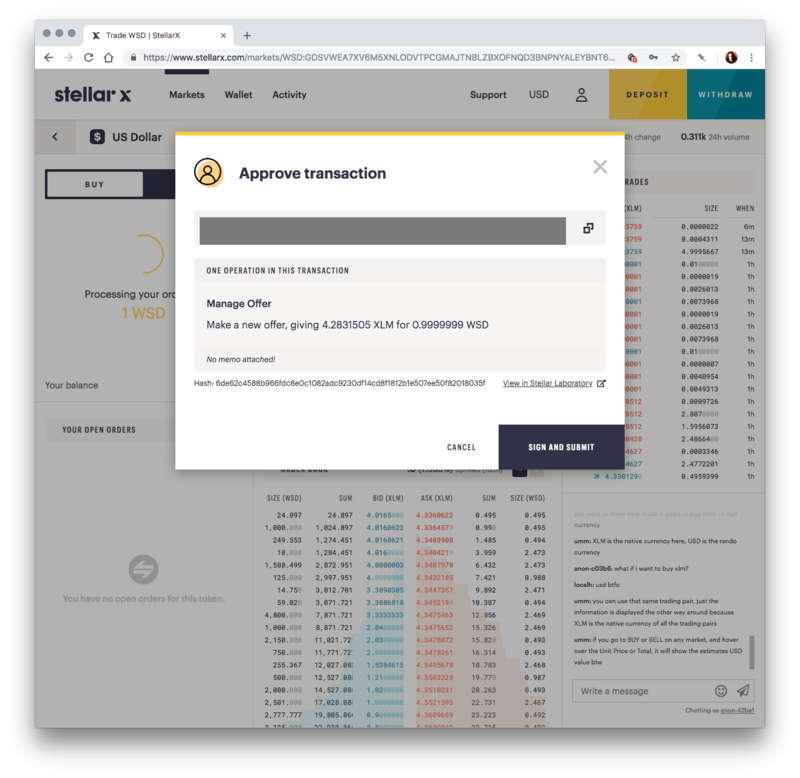 It's possible to exchange Stellar for local fiat without paying any transaction fees. That can make a big difference for large transactions. Fiat pairs available on the Stellar distributed exchange. Buy lumens, Stellar's native currency, on an exchange. Withdraw the Stellar into an account where you control the private key. You can create an account using the Stellar Account Viewer. Log in to the Stellar distributed exchange with your public key through a service like StellarX or StellarPort.io. Select an anchor and use your lumens to purchase an equivalent amount of fiat tokens. In the above transaction, we're buying 1 WUSD for 4.283 XLM. The recipient of the transaction then needs to sign up for an account with the anchor that you selected. The anchor will provide them with a Stellar address. A transfer from $1WUSD to a real-world dollar through White Wallet took a day to settle through ACH transfer—with no fees. The hype behind these games is often ignores the most important question: whether they're actually fun. We put together this guide by testing dozens of games across Ethereum, EOS, and Bitcoin to help you pick the best decentralized platform for gaming.